Ahhhh, summer fruit...how I love you so. In my very humble opinion, raspberries & nectarines are the creme de la creme of the fruit world. Peaches are tied for that title as well, but you are supposed to peel them when baking, so of course I opt for the easier, skin-on nectarine (I'm kinda lazy). And don't even get me started on talking about the fruit crisp as a dessert...I love any version. It can do no wrong. It's 100% right. This one just happens to be the best combo of all. I love the addition of almond flour and sliced almonds - it's a nice little layer of crunchy nuttiness. In a large bowl, combine raspberries, chopped peaches, sugar, and almond extract. Sprinkle cornstarch over fruit & stir gently to combine. In another bowl, combine brown sugar, rolled oats, almond flour salt, and cinnamon. Cut butter into small pieces and add to bowl. Using a pastry cutter or 2 knives, cut butter, mixing into dry ingredients until the mixture resembles coarse meal. Stir in almonds. Divide berry mixture between six, 6 ounce ramekins. 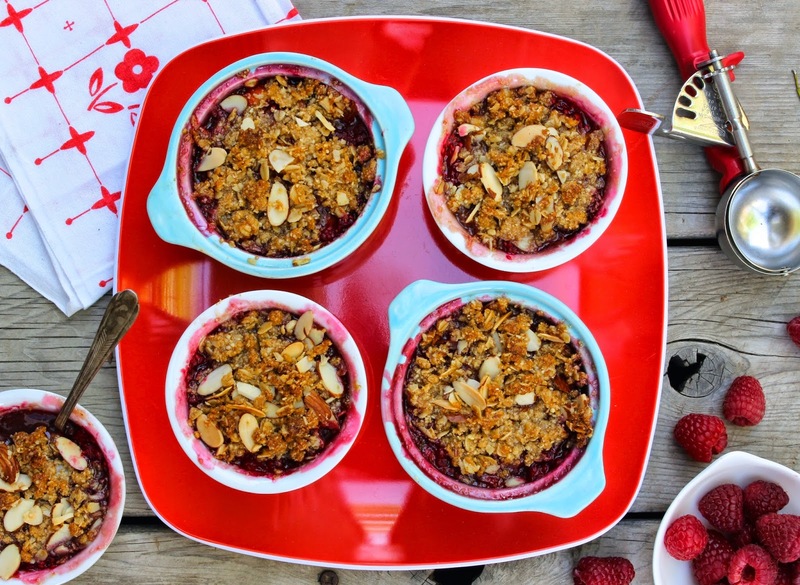 Top each ramekin with crisp topping. Place on a foil-lined rimmed baking sheet (to catch spills) and bake 25-30 minutes until fruit is bubbling & topping is brown. Let cool at least a half hour to an hour before serving. Top with vanilla ice cream or whipped cream & serve warm! Thanks, lady! I'm a huge fan o' you, too! Summer is definitely in full effect here...enjoy your cozy nights!